FORMER FIRST Lady, Nana Konadu Agyeman-Rawlings says Africa lacks strong legal instruments to protect women and girls against violence. According to the former first lady, Africa unlike other continents, needed to strengthen it laws to help eradicate violence against women and girls. 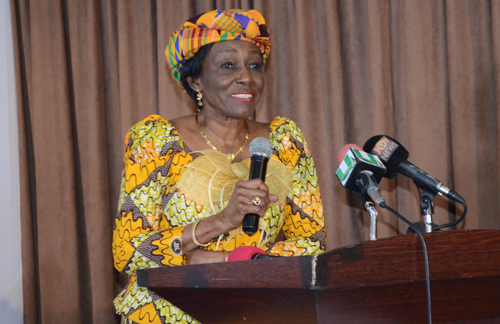 Nana Konadu who made this known at this year’s International ‘SHEROES’ Forum in Accra last Thursday said there were millions of women and girls in Africa who face violence and discrimination on daily bases and are denied their basic rights to choose the direction of their lives. The International ‘SHROES’ Forum was an event with the objective to recognize and celebrate great African Women who have paved the way for gender equality, as well as Female Leaders of diverse achievements from all over the world. It was also to share new perspectives on key issues facing women. “At the Beijing Conference 20 years ago, we envisioned a world where women will have the right to self determination just like our men counterparts do. We envisioned a world where women are free from violence and discrimination and have the right to contribute to the development of their society,” Mrs Rawlings stated. Nana Konadu lamented that it appeared the 189 governments and over 30,000 women’s right activists who convened under a common umbrella two decades ago to achieve some of the above stated policies were not translating the commitments into reality fast enough. She therefore called for the re-examination of the mode of implementation of what was decided on in Beijing and how to achieve gender equality in Africa and the world as a whole. Flossy Tachie-Menson, founder and director of ‘SHEROES’ disclosed that there was the need to re-define the rules of engagement on issues of gender equality if a difference was to be made in the life of women and society at large. “We need to change the tradition where the African Women’s perspective is only sought behind the scenes. As women, we need to move from being the successful other half of helping ourselves. The time has come to create a powerful global network of women so that we will become a force to reckon with. As women, we may all have our differences, but that should not stand in the way of cohesiveness among the sisterhood. The event brought together a league of industrious women around the world including H.E. Dr Joyce Banda, former president of the Republic of Malawi and Cecilia Wijgers, Acting Ambassador of the Netherlands to Ghana among others.